Think about the last wedding you attended. You probably remember what you wore. You might remember what the bride wore. What about the decorations or flowers? Now think about the Wedding Cake. Can you remember what it looked like (without cheating and looking at photos)? Better yet, do you have any idea how it tasted? Exactly. So why is it that, for an item that will by and large live out its remaining days at the bottom of a freezer (best case scenario) or a dumpster (most likely scenario), we’re told it’s perfectly acceptable to spend upwards of $500 to have The Perfect Wedding Cake. And, yes, I know that price is at the extreme low end of the scale. After perusing dozens of websites and forums and suffering through a number of futile email threads and phone calls, I decided that there had to be a better way. That better way was my Maid of the Mist and my Mother. A few universal constants hold true with regard to my Mom: She’s always polite (especially when she answers the phone); She can curse – not unlike a trucker, but still politely (a rare talent) – when it’s required; She never leaves the house without her hair combed & a dash of lipstick; and she’s one BAD mofo in the kitchen. My Maid of the Mist (so named at her request because, really, everyone has a Maid of Honour) made the clever suggestion that I go to my local grocery store, buy some plain layer cakes frosted in white, take them home and decorate them myself (what I have in mind is nothing intricate and quite easily done – fingers crossed). My Mother took that idea one step further and offered to bake them. YAY for M.o.M and Mom! If you’re not lucky enough, though, to have a M.o.M or a Mom like mine, there are other ways around the astronomical cost of your wedding day baked goods. Bakeries tend to base their price on a per-serving amount (e.g. $2.75 per person/serving. No, really. And that’s an extremely kind example) and assume you’re buying a cake big enough to feed each person on your guest list. 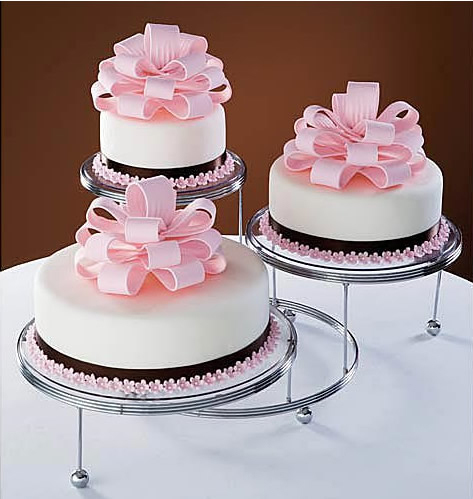 Caterers will offer a better suggestion if you do decide to go the traditional route of paying a bakery for your cake: base your cake size on enough to feed half of your guests. Because chances are you’re going to have sweets of some kind included with the food you serve, whether you’re going the way of the sit-down, 8-course dinner or are veering toward a cocktail party and passed hors d’oeuvres. Another fantastic idea (and one that I had no idea was even an option until I started doing a bit of looking around) is the faux bottom layer(s). Seriously – you can have the elaborate princess-y 5-tier cake, if that’s to your liking, that’s actually 4 layers of some Styrofoam-type material and one of actual cake. It all gets decorated the same – with real icing or fondant – but you only cut into and serve that top layer (and, really, what more do you need for your photos?). 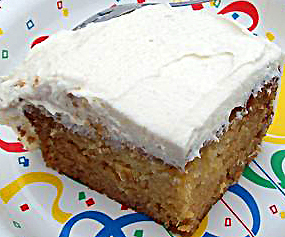 If you still want to feed cake to your guests, you can have (in addition to your one photo-ready top tier) a giant slab cake made and hidden back in the kitchen where nobody can see that gets cut up and served in the place of the fancy-pants (and overpriced) tiers that you’ve chosen to not have baked in the first place. Pretty clever, right? I like it. So, whether you have a Dynamic M.o.M/Mom Duo or you opt for the crafty faux layers of cake, you’re still likely to end up with leftover cake. But at least, if you go one of these two routes, it won’t be quite so painful. This entry was posted on Tuesday, March 23rd, 2010 at 11:13 am	and is filed under The Confessional. You can follow any responses to this entry through the RSS 2.0 feed. You can leave a response, or trackback from your own site. Love your comment about the faux layers. That’s been around a LONG time and your Dad & I had it at our wedding. A lovely 3-tier cake, (baked by Gram – see, it runs in the family) large bottom one was fake and another (same size) which we cut up in advance, wrapped, and passed round to our guests.